Nestled midway between New York and Florida along the southeastern coast of North Carolina, the Cape Fear Coast is a place of uncommon beauty and a nautical legacy that spans centuries. 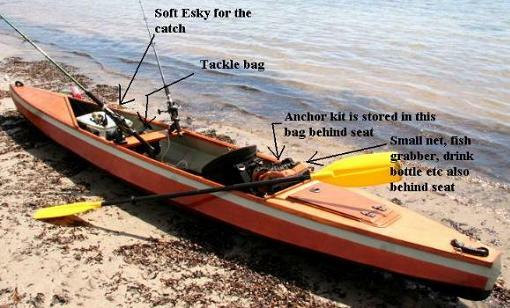 The Cape Fear is multifunction kayak designed for recreational paddling. The front deck is raised slightly above the sheer line and allows for open storage or leg room. The open middle cockpit is intended for easy entry, exit, and quick access to gear. The rear deck and easy-to-make hatch creates a large, dry storage compartment with the bulkhead behind the seat. 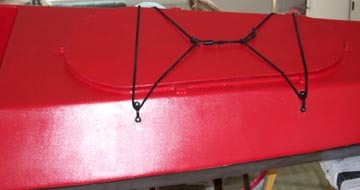 The plans show how to make a hatch but you can make your own style hatch, or install a pre-made hatch. 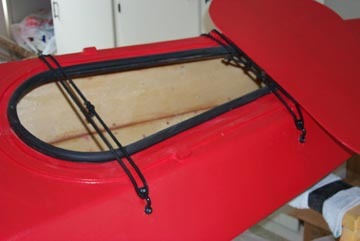 The flat deck is also ideal for mounting fishing rod holders. A flat back was incorporated for easy hull assembly and to install an optional rudder. Note:the flat portion is above the waterline for no turbulence making easier and quieter paddling. Rig your boat any which way you want to make it the ultimate fishing machine! Estimated displacement weight at the waterline. See our difference options for the plans. About $200 for epoxy and fiberglass. Up to $250 for plywood depending on species and quality chosen. The hull can be built in 40-45 hours. Up to 20 hours to fair and paint depending on the desires and skills of the builder. Visit our Customer Service Forum to post questions and see get more info about out build process. Nesting drawings for the best plywood layout with numbered parts. Panels Drawings on 11" x 17" paper. Detailed, specific building notes for this boat.